The National Alliance on Mental Illness (NAMI) until recently was reluctant to reveal the source of its funding. But thanks to Sen. Grassley we now can learn NAMI's sources for Major Foundation and Corporate Support, which you can find here. I downloaded the list of "funders" for 2009. Fortunately, unlike pharmaceutical companies who have revealed monies paid to physicians (see, for example, "Transparency Vs. Translucency in Reporting Physician Payments"), NAMI's numbers are easy to copy into Excel spreadsheets and analyze. Lilly was next on the list having donated $750,500.00 to NAMI in 2009. Recall that Lilly markets Cymbalta and that it recently received a warning letter from the FDA about misleading a Cymablta print ad -- ie, re: "omission of risk information." Cymbalta is indicated for treatment of depression among many other things these days (see "The Cymbalta Buzz Machine is at Full Throttle!"). 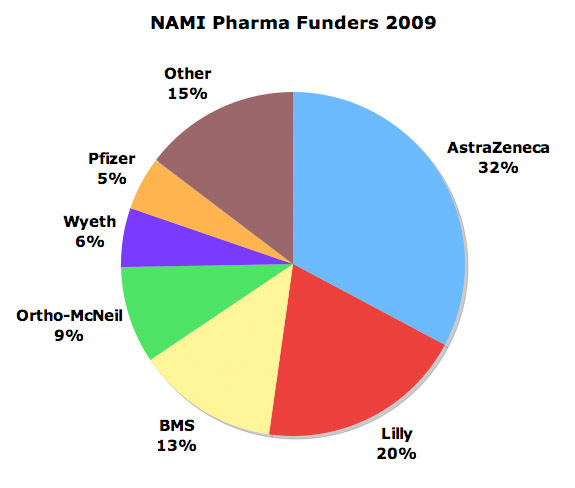 The third biggest NAMI pharma "funder" for 2009 was BMS, which donated $506,250.00. Recall that BMS markets the drug Abilify for bipolar disorder. Some time ago, Andy Behrman -- BMS's patient spokesperson for Abilify -- went on a campaign against the very product he endorsed for money (see "Andy Behrman, Now an Anti-BMS Spokesperson, Says 'Ask Your Doctor If Abilify is Wrong for You'"). It's a crazy, crazy world out there in the marketing of mental illness drugs! Figures. Pharma has a vested interest in seeing that 'family advocacy' organizations like NAMI are well-funded. Groups like NAMI are essentially cheerleaders promoting psychiatry's 'drug first, dispense with the relevant questions altogether' approach to dealing with troubled individuals. Unfortunately almost no thought is given to the human cost of htis approach. Hold on!! Maybe I am looking at this through a different set of glasses but why wouldn't a pharma company with drugs for mental health wish to support the "largest grassroots organization dedicated to improving the lives of individuals and families affected by mental illness" (NAMI website) I still believe that pharma companies are trying to accomplish the same goal although you certainly pointed out some excesses in that effort. I must admit that I have not followed this closely but did AZ, Lilly or BMS engage in questionable activities with the cooperation of NAMI. I read quickly through the AZ HHS press release and did not see any mention of NAMI. Is this guilt by association? Is it possible that some of what AZ or Lilly or BMS does is above board in attempting to support "improving the lives of individuals and families affected by mental illnesses"? Lastly I am not a fan of Senator Grassley. I think he often misses the mark. There is no question that our industry has performed some egregious acts but I do not want to hold out Senator Grassley as the end all and be all expert on the industry. I always find it of interest that politicians like Senator Grassley can decry contributions to organizations like NAMI and infer some negative intent while they claim that political contributions that they grovel around for have no impact on their decision making? It's no different except for the fact that NAMI, until recently, has steadfastly refused to reveal its sources of funding. Also, it is ironic that the major pharma contributors have run afoul of the law and FDA regulations regarding promotion of their mental health products -- NAMI may wish not to be so closely associated with such bad behavior. Their members should know what NAMI's funders are doing. It also highlights the growing threat and active participation of organized crime syndicates in online criminal activity.